Turn your PDFs into DOC documents you can edit. PDF - DOC converts PDF files into Microsoft DOC documents. PDF - DOC preserves the text, layout and images of your original document. In 1993 Adobe Systems Inc. introduced what is originally known as Adobe Acrobat. The main goal was to develop software that will become a standard for large electronic documents transmission. After some time and tough competition PDF has finally become the format of choice for businesses and individuals around the Globe. But as almost every family has its black sheep, every file format has its limitations. PDF main drawback is that it can't be edited easily. The only way to edit information contained in PDF format is to convert it to Word or text. 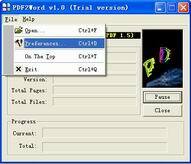 VeryPDF is here to provide you with powerful PDF to Word program that will easily change PDF to Word format in no time. PDF format can be described as "What-You-See-Is-What-You-Get" format or simply a "snapshot". Without PDF to Word or text conversion program, it will be simply impossible to make changes in PDF or edit it if you're not an author. Moreover, very often when you try to do some manipulations with the graphic portrayal of a text called PDF, you can face with such problems as freezing of the computer or its slow performance. If you want to get rid of these inconveniences and see PDF in Word for further editing, there is probably no better way to convert PDF file to Word than with the help of our conversion software. VeryPDF PDF to DOC instantly converts PDF files into Microsoft DOC documents that look just like the original, complete with all formatting and images! Information is set free, free to be edited and free to be integrated into your documents. PDF to DOC program from VeryPDF.com Inc. has another very important advantage, it is a very easy-to-use application to convert PDF file to Word. You don't have be a computer genius to change PDF file to Word with the help of our software. You are also welcome to try our PDF to Word program demo version before you decide to buy a full-featured one. PDF-to-DOC is a standalone software, MS DOC, Adobe Acrobat and Reader NOT required! Convert PDF to Microsoft Word (DOC), or rich text (RTF) documents – one at a time or in a batch. Precisely convert a much wider variety of PDF files than is possible with alternative solutions, such as Adobe Acrobat. Create well-formed Microsoft Word (DOC) and Rich Text (RTF) files from your PDF documents, with properly properly-formatted columns, tables, headers & footers, and more. Quickly extract all text and images contained within your PDF files, for simple reuse in other programs.